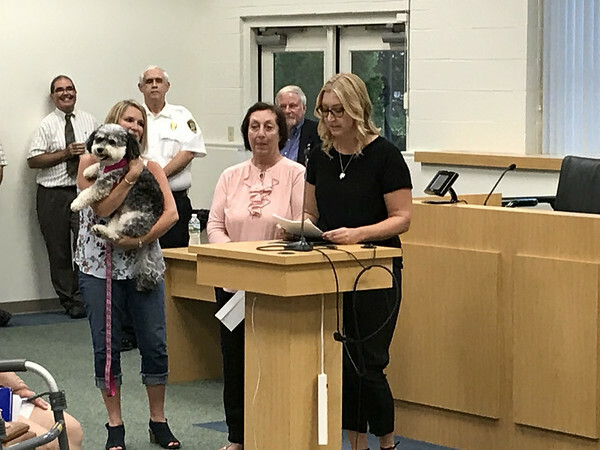 SOUTHINGTON - At Monday’s Town Council Meeting, resident Michelle Terninko thanked “local hero” Dave Bottaro and the Southington, Bristol and Plainville fire departments for their efforts to rescue her pets when her home caught fire June 29. The fire that destroyed the house at 54 Pattonwood Drive claimed the lives of Terninko’s dog, Ollie, and her mother’s cat, George. However, thanks to Bottaro’s efforts, Izzy, a 5-year-old rescue dog, was saved from the burning home. As Terninko approached the podium, one of her friends stood behind her holding the dog. Terninko said that George and Ollie were “not just a dog” and “not just a cat” but beloved family members. Terninko said that she has fostered many animals, many of which came from abusive homes, and volunteered at numerous shelters. She said that she wished to honor the memory of her pets, celebrate the bravery of those who fought the fire and highlight the importance of adopting animals from local shelters as well as donating to shelters. “On the day of the fire I was on my way to a Yankees-Red Sox game when I got the call from a friend who was alerted to the house fire by a family member,” Terninko said. Terninko said that she later learned that Bottaro had seen the smoke while driving by the house and stopped by to help along with two other neighbors. They had heard the dogs barking inside and found an open back door. “The smoke was thick and he crawled on his hands and knees trying to find the animals,” she said. Bottaro was given a citation at the meeting for his heroism and a hug from Terninko. The council also recognized the Southington Fire Department, the Bristol, Plainville and New Britain Fire Department and the AMR Ambulance. The Terninko family used a portion of the donations created for the family in a Go Fund Me account to benefit charities and the local community. She donated a portion to a charity of Bottaro’s choice; the Visiting Nurse Foundation of Florida. A donation of pet oxygen masks and money to support pet oxygen mask training was made to the Southington Fire Department. A donation was also made to the Southington Animal Control in memory of Terninko’s deceased pets. Posted in New Britain Herald, Southington Herald on Tuesday, 28 August 2018 20:16. Updated: Tuesday, 28 August 2018 20:18.